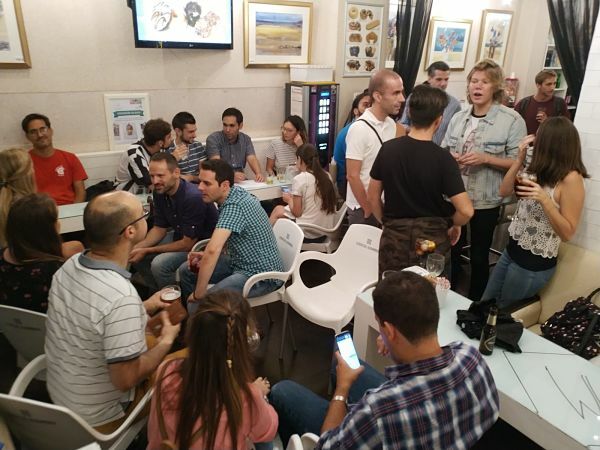 En el Intercambio de Idiomas Calle San Fernando 180928 podrás pasar un buen rato con amigos de todo el mundo mundial. Lo primero de todo es el punto de encuentro que es en la Calle San Fernando número 13, por lo tanto, enfrente del Hotel Alfonso XIII. Habrá idiomas para todos los gustos, con gente de diferentes lugares con ganas de practicar idiomas. ¡Todo el mundo es bienvenido! Empezamos a las 21h, habrá gente amable en un lugar animado y a saber a qué hora acabaremos. Disfrutemos de una interesante charla con nuevos amigos y una buena bebida, porque otra forma de practicar idiomas es posible. Como resultado, mejorarás tus habilidades con los idiomas. Además de este evento, hay otros encuentros semanales si quieres practicar idiomas otro día. Por esa razón, échale un vistazo al calendario de Intercambio de Idiomas. Finalmente, para la quedada de esta noche vuestros anfitriones serán Paco Gutiérrez y Teresa Camacho. Para enterarte de todas nuestras actividades, realizar cualquier consulta o seguir practicando idiomas, sin duda tienes que acceder a alguno de nuestros Grupos de WhatsApp de Intercambio de Idiomas. Tenemos grupos para diferentes idiomas y, aún más, para realizar otras actividades que no tienen que ver directamente con los idiomas (películas, deportes, salidas, bailes, turismo, etc…). In the Language Exchange Calle San Fernando on Fridays, you can have fun with friends from the whole world. First of all is the meeting point which is San Fernando street number 13, therefore, opposite Alfonso XIII Hotel. There are a lot of languages, people from different countries are coming who are excited about practicing languages. Everyone is welcome! We start at 9pm, there will be nice people in a lively place and who knows when we will finish. Enjoy talking to new friends and having a good drink, because other way of practicing languages is possible. As a result, you’ll improve your languages skills. Besides this event, there are more weekly meetings if you want to practice languages other day. For the reason that we told you, check the calendar of Language Exchange to know other meetings. Finally, your hosts for this meeting will be Paco Gutiérrez and Teresa Camacho. If you want to know everything about our meetings, ask a question or keep practicing languages, certainly you must join our Language Exchange WhatsApp Groups. We have groups for different languages and, even more, for doing different activities which they don’t have a direct relation with languages (movies, sports, going out, dancing, sightseeing, etc…).